Once Harry, Ron, and Hermione have gained access to the vault catacombs in Gringotts they eventually make their way into the vault of Bellatrix LeStrange and find the fourth horcrux, the Hufflepuff House Cup. However, leaving Gringotts proves to be more difficult than gaining access was for our heroes. Once again, it is Hermione to the rescue. Ever practical and conservative, Hermione rolls the dice in a moment of desperation when she devises an escape riding the back of an albino dragon that protects the vaults in the bowels of Gringotts. Hermione admits it is a “mad” idea, but as is the case with most of her ideas throughout the saga, it works brilliantly. 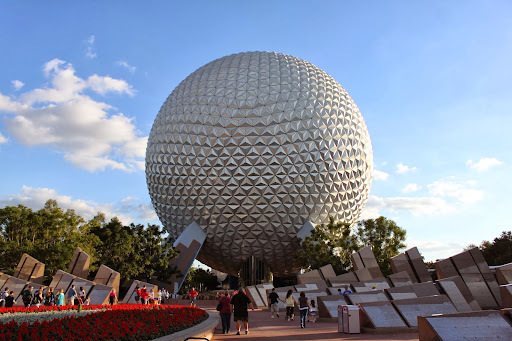 The only puzzling part is what happens to this enormous dragon that has been released into the world, once Hermione, Harry and Ron jump off of it. Who cares, there are more horcruxes to find. Let the muggles figure out what to do with the dragon. Lord knows, they haven’t lifted a finger in solving this whole Voldemort situation. The plot of this final Potter film brings us full circle in many ways, including Harry’s return to Hogwarts, with the help of Dumbledore’s brother Aberforth. 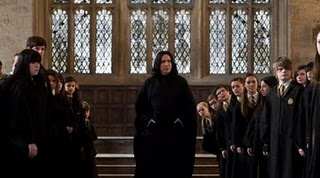 Hogwarts, now under the oppressive rule of its new headmaster Severus Snape, has become reminiscent of a prison camp, as the students are marched across the courtyards in regimental rows to the Great Hall, which has been stripped of its enchanted ceiling and its enumerable illuminating floating candles. Not so “Great” any longer, the Hall has been reduced to a dark and morbid mustering point where the ordinarily absent Snape interrogates what appears to now be a paltry student body. Harry reveals himself in what could be called a “triumphant” return to Hogwarts and confronts Snape bravely, as we have come to expect from our reluctant hero. Snape abdicates his Headmastership and leaves Hogwarts after a brief duel with Professor McGonagall, who steals several of the scenes she appears in during the film. The remainder of the storyline plays out at Hogwarts, as it should. 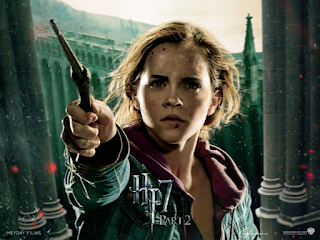 While Hermione and Ron visit the Chamber of Secrets to retrieve a basilisk fang to destroy the Hufflepuff Cup horcrux (the Goblin Griphook had taken the Sword of Griffindor in exchange for his assistance in gaining access to Gringotts), Harry must visit with the Ghost of Helena Ravenclaw, daughter of house founder Rowena Ravenclaw. According the Luna, Helena knows the location of the next horcrux. Here again we hark back to the earlier Potter films and the more common appearances of ghosts about the Hogwarts castle. Harry’s sincerity and genuine goodness shine through again, as Helena Ravenclaw consents to share with him the location of the lost diadem of Ravenclaw. On a side note, it is interesting that, Voldemort, the Heir of Slytherin, has hidden two pieces of his dark and evil soul in items symbolic of two of the other Hogwarts founders. Perhaps more interesting is the fact that they are the two female founders. Could this be a veiled reference to Voldemort’s own angst over losing his mother at such a young and tender age? Harry, Ron, and Hermione retrieve and destroy the Lost Diadem of Ravenclaw as Voldemort’s forces lay siege to the Hogwart’s castle. The castle enchantments cast by the dutiful Hogwarts staff hold off Voldemort’s army of Death Eaters, Snatchers, giant trolls, and other assorted evil riff raff (as expected, all clad in black) for a while, but the inevitable becomes a reality as the sanctity of Hogwarts is eventually defiled with dark forces hungry for blood. 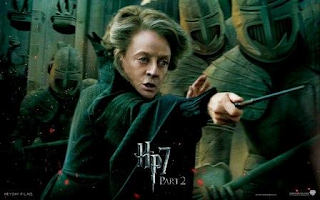 There are some touching scenes throughout this portion of the film, as we see Hogwarts professors like the stern yet grandmotherly McGonagall, defend not only the castle, but the children she has nurtured and educated for so many years. Harry discovers through his mental connection to Voldemort, that the snake Nagini is the last horcrux. Harry, Ron, and Hermione track down Voldemort and Nagini in the Hogwarts boathouse, where the Dark Lord has summoned Snape for a discussion. In a subplot involving the allegiance of the Elder Wand, Voldemort commands Nagini to attack and kill Snape so that the Elder Wand will answer to him alone. Voldemort dissapparates, leaving Snape mortally wounded, but alive. 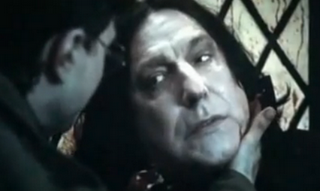 Once again, Harry displays his endless compassion and humanity as he tends to Snape’s wounds. Snape asks Harry to gather his tears, which contain vital memories, and bring them to one of the greatest plot exposition contrivances ever, the Pensieve. Harry and the Hogwarts faithful are granted a temporary cease fire by Voldemort, who demands that Harry meet him in the Forbidden Forest within an hour, or have the blood of every man, woman, and child who conceals him on his hands. Harry honors Snape’s dying wish and uses the Pensieve to view his memories. In what could only be described as an emotional roller coaster flashback sequence, we learn what I suspected all along, that Snape was in fact loyal to Dumbledore and Harry since the first film. The memories reveal Snape’s lifelong love for Harry’s mother Lily and the obsessive allegiance he pays to her, by protecting Harry throughout his entire life. So much is revealed in that sequence and its impact to the storyline, the characters, and the plot are enormous. Recounting it here does not do it justice. One critical piece of information that Harry learns during his trip down Snape Memory Lane, is the existence of additional horcrux that he had not anticipated. He doesn’t have far to look for this one however. It seems that on that fateful night in Godric’s Hollow, when Lily Potter gave her life to protect infant Harry, a piece of Voldemort’s soul latched itself onto the only other living thing in the room…Harry. Sadly, In a sick and ironic twist of fate, we learn that Harry Potter himself is the final horcrux and must die in order to destroy Voldemort. Having learned this, Harry resigns himself to the fact that he must confront Voldemort in the Forbidden Forest and must sacrifice himself to save the world. Before his confrontation with Voldemort, Harry discovers that the Snitch that Dumbledore left him in his will contains the fabled Resurrection Stone, told of in the legend of the Deathly Hallows. Harry uses the stone to summon the visions of his parents Lily and James, his godfather Sirius Black, and his former teacher Remus Lupin. In yet another touching scene, Harry prepares to face his death and apologizes to his departed loves one, telling them he never wanted any of them to die for him. It is staggering to behold and impossible to fathom that a teenage boy, who in the real word would most likely be consumed with adolescent thoughts of nothing but himself, would be apologizing for events entirely beyond his control, particularly after all of the pain, heartache, responsibility, and anguish that was thrust upon him, including a destiny that culminates with his becoming a sacrificial lamb. Harry arrives in the Forbidden Forest and confronts Voldemort. With Hagrid, who has been captured and bound by chains looking on, Voldemort casts the killing curse upon Harry once again. There is a fade out then back in from white that reveals Harry in an eerily sterile version of Kings Cross Station, where he is greeted by Dumbledore. Dumbledore reveals to Harry that he has destroyed the horcrux that lived inside him and that he has a choice to go back to complete his destiny should he chose to do so. 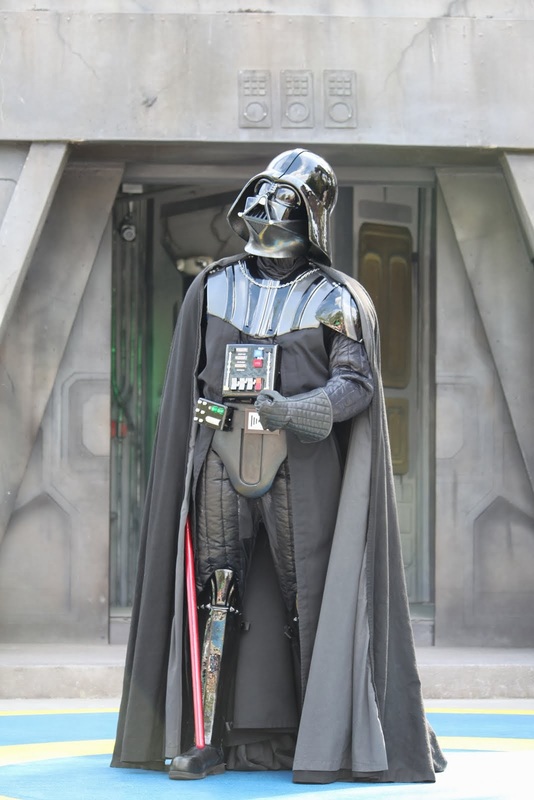 I think you can guess what our hero chooses. Harry returns to the Forbidden Forest, where he pretends to be dead following his Avada Kedavra ride of the green lightning. Narcissa Black inspects Harry’s body for Voldemort and finds that he is alive. Much like Draco did not reveal Harry’s identity to Bellatrix LeStrange when he had the opportunity at the end of Deathly Hallows Part 1, Narcissa lies to the Dark Lord and claims that Harry is dead, in the hope that she can be re-united with her son Draco, whom Harry has revealed is still alive at Hogwarts. Voldemort arrives back at Hogwarts as the conquering hero, followed by scores of his followers, led by Hagrid carrying the seemingly lifeless body of the Chosen One in his arms. The hapless hero Neville Longbottom steps forward to verbally confront Voldemort and delivers an inspiring speech that highlights the fact that although they have lost many friends and family members in their struggle to maintain their liberty from the evil and oppressive Voldemort, those loved ones live on in their hearts and will always be with them, a sentiment that is echoed in the scene when Harry uses the Resurrection Stone to speak to his deceased loved ones. 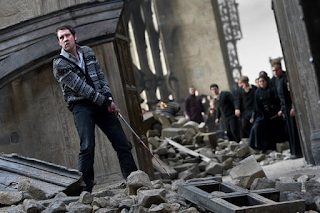 Undaunted, Neville tells Voldemort that Harry and their friends didn’t die in vain, but he will. In this moment of need, the Sword of Griffindor presents itself to Neville, a worthy member of its house, and Harry reveals that he is alive, springing from Hagrid’s arms and sprinting across the castle forecourt. Unable to believe what he is seeing, Voldemort begins to furiously launch spells at Harry to no avail. Upon seeing Harry’s apparent resurrection, most of Voldemort’s troops flee his side, leaving him nearly alone to battle Harry and the Hogwart’s faithful. 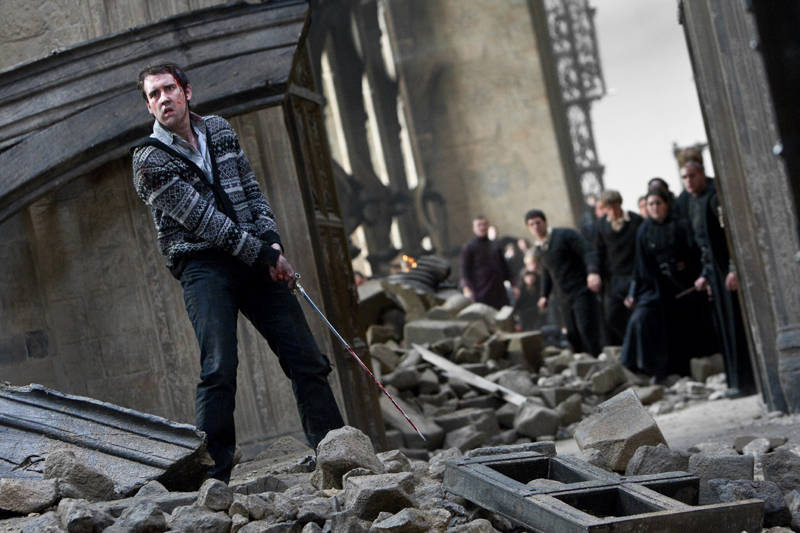 Voldemort casts a spell at Neville, which he blocks using the sword, and he is thrust across the castle forecourt. Voldemort spends the next few scenes chasing and dueling Harry about the grounds of Hogwarts. Bellatrix LeStrange meets her end after trying to attack Ginny. Molly Weasley’s motherly instincts burst to the surface as she unleashes a barrage of curses on Bellatrix until one gets through her defenses. Molly petrifies Bellatrix and follows that up with another curse that shatters Bellatrix’s frozen form into a million fractured shards. As the action builds to a climax, Hermione and Ron are being pursued by Nagini and Harry and Voldemort are locked in a duel outside the castle. As Nagini is about to strike, Neville, appears and with one mighty swing of the Sword of Griffindor, beheads the snake and destroys the last Horcrux. 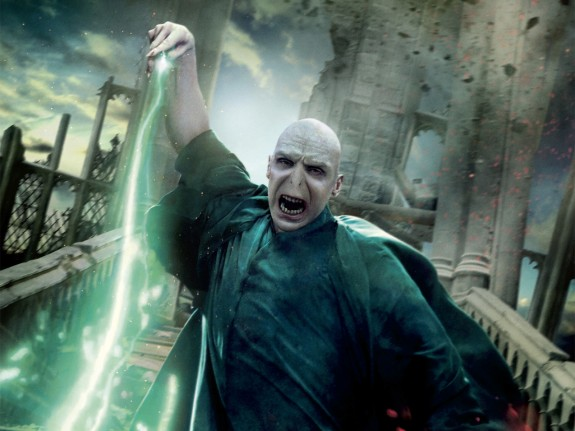 Sensing that he is mortal, Voldemort launches one final volley of the Avada Kedavra curse at Harry, which he repels. Voldemort is disarmed of the Elder Wand and he literally begins to deteriorate before our eyes, as his mortal form peels away into flaky cinders, which float through the air and dissipate into nothingness. 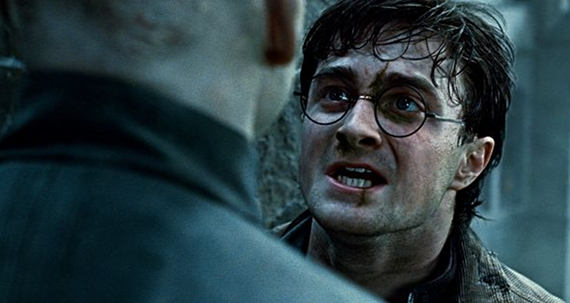 The evil Voldemort is defeated and Harry’s destiny as The Chosen One is fulfilled. There are some casualties in the Battle for Hogwarts (Lupin, Tonks, Fred Weasley, Lavender Brown) but in the end, good prevails and the Harry Potter saga draws to a close. 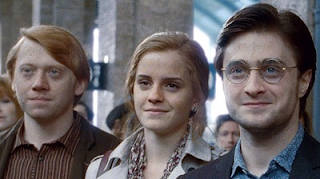 There is an epilogue section of the film, which takes us nineteen years into the future as Harry and Ginny’s youngest son, Albus Severus Potter, prepares to take his first ride aboard the Hogwarts Express. Ron, Hermione and their children are there as well. In fact, we even see a glimpse of Malfoy who appears to have settled down and started a family of his own. The final chapter in the Harry Potter film saga was everything that you could have expected. The film delivers on action, emotionality, stellar acting performances, dazzling special effects, and another stalwart directorial effort from David Yates. If you haven’t seen the other films, you shouldn’t see this one. 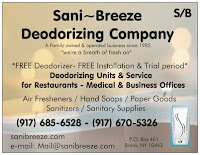 What you should do is this. Read each book, followed by watching each film. When you get to the end of Deathly Hallows Part 2, you can thank me.